A Cave or a Cavern ? What is the difference between a cave and a cavern? Many times, the names are used synonymously, but this isn't technically right. A cave is defined as any cavity in the ground that has a section which does not receive direct sunlight. A cavern is just one type of cave which is formed naturally in soluble rock and grows speleothems (the general term for cave formations like stalagmites and stalactites). So, a cavern can rightfully be called a cave, but not all caves are caverns. Caves are categorized into two main types - primary and secondary - which are distinguished by their origin. Primary caves are those developed while the host rock is still solidifying. These include lava tubes and coral caves. Secondary caves are those which are carved or eroded out of the host rock after it has already solidified. The majority of caves are secondary, but sometimes erosion or tectonic movement can reshape primary caves. 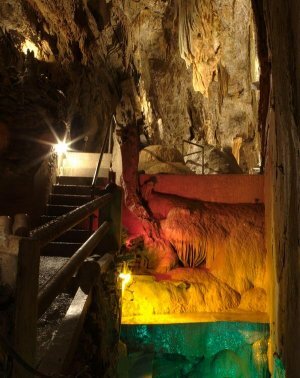 Smoke Hole Caverns are a system of beautiful caverns in Grant County of West Virginia's Eastern Panhandle. They are lockated on WV 26, 13 km west of Petersburg. 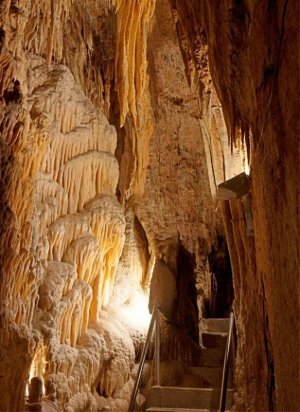 The Caverns were opened to the public in the 1940's and were given their name for their proximity to Smoke Hole Canyon. Historians believe that Native Americans used these caves for smoking meat, giving meaning to the name Smoke Hole for the Caverns and Canyon. Soldiers during the American Civil War also used the Caverns to smoke meat, and local folklore says that moonshine was run through the Caverns during Prohibition times. Smoke Hole Caverns houses an artesian well, and this source of fresh water combined with there only being one entrance to the Caverns makes it a perfect production center for moonshine. 600 million years ago, the Continental Drift began separating the Americas from the western coasts of Europe and Africa. This helped to form a broad depression stretching from Alabama to Newfoundland, Canada. For the next 400 million years, the area that is now the Appalachian Mountains was flooded and sediments including limestone, fossilized marine animals and shells, accumulated on the sea floor. The weight of this sediment eventually compressed it into metamorphic rock. Later tectonic movement caused the plates holding North America and Africa to collide. This caused a fracture in the sea floor and an underlying layer of rock to slide over the younger layer and created a towering mountain range - the Appalachians. The formation of the Smoke Hole Caverns began after that inland sea had deposited limestone in the Seneca Rocks area. Acidic water and carbon dioxide mixed over millions of years and hollowed out pockets of the limestone, forming caves. There are no indications that the Smoke Hole Caverns contained large flowing streams of water, it seems that most of the cave deposits were transported by very small discharges of water. Rain water will pick up diluted carbonic acid which seeps through cracks in the limestone and dissolves layers or rock along its path. This acid and water erosion is what will eventually hollow out large chambers in the rock beneath the surface. Unique speleothems are formed when the large quantities of water drain from the caverns and only slow seepage continues. As the water subsides, carbon dioxied is released by the calcium carbonate and creates a precipitation of lime. This process begins as just a thin ring of deposited crystallized calcite. As the condensation precipitates, the drops leave behind traces of minerals and form stalactites hanging from the cave ceiling. Stalagmites are formed on the floor of the cave, where these drops land consistently. With time, a stalactite and its corresponding stalagmite may come to meet, forming a column or pillar. 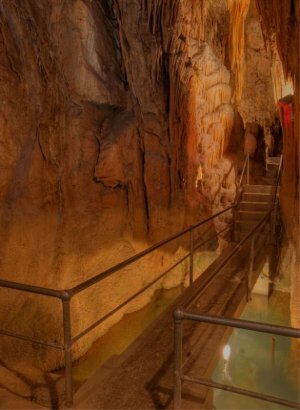 Smoke Hole Caverns is an active cave, accumulating one cubic inch of new deposits every 120 years. Stalactites are formed from the cave ceiling, and stalagmites resemble mounds rising from the floor. Dripstone can cover cave ceilings and floors, but is most apparent on cavern walls. These formations are often much larger, and are formed when the mineral-bearing water slides across the walls or on protruding ledges. These deposits are also known as flowstone, and can form draperies, frozen waterfalls, veils and tents. Stalactites form when mineral laden water drips from the cave ceiling. Each drop leaves minerals behind and adds to the length of the hollow capillary tube which will convert into a stalactite once the end of the tube closes off. Stalagmites are formed on cave floors by the minerals left from dripping water from the ceiling - usually from stalactites above. Columns occur when a stalactite and stalagmite grow into each other. Draperies are sometimes called curtains. They form when the mineraled water slides along cracks and crevices in the cave ceiling and walls. Flowstone is a product of flowing water rather than drops. Calcite becomes deposited in thin layers which mold to the shape of whatever surface it clings to, but eventually thickens and takes on a rounded appearance. Helictites are a class of stalactite. They can grow in any number of different directions, depending on air flow in the cave and varied arrangements of the calcite crystals. Calcite is the mineral of malcium carbonate (CaCO3) and is the main ingredient in limestone. Capillary Tubes are cave formations that resemble straws coming down from the ceiling, and will eventually become stalactites. Caves are natural cavities underground that typically have an opening to the surface. 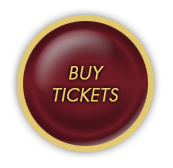 Chemical weathering is the process by which chemicals erode away layers of rock. Columns are formed when a stalactite and its stalagmite grow until they meet and are joined together. 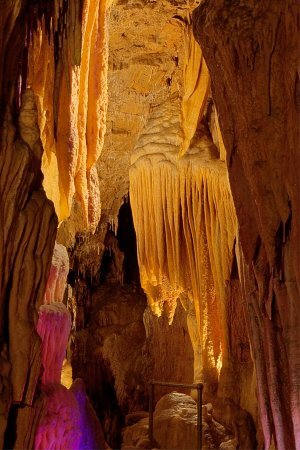 Curtains are drapes of calcite that form when mineral rich water slides down the cave ceiling or wall. Erosion is caused by wind, water, glaciers, etc. and is what causes both subtle and drastic changes to rock or landscape. A fault is an opening or separation in a rock. Flowstone is a layer of calcite that is deposited on a surface by flowing water. Helictites are twisted or bent stalactites that are shaped by air currents or varied arrangements of calcite crystals. Limestone is a sedimentary rock that is easily dissolved by acidic water. Most of the world's caves are carved into limestone. Cave Dwellers (troglobites) live their entire lives inside caves. These include blind cave fish or crawfish. Cave Guests (troglogenes) are animals who spend most of their time on the surface but use caves for shelter or for hibernation. These include bears and bats. Cave Lovers (troglophiles) spend most of their time inside caves, and are typically found near partially-lit cave entrances. These include salamanders and cave crickets.